SAGE India Digest: How to create RADIO DRAMAS that encourage social change! While internet access is growing throughout the world, radio still remains an important and widespread medium which can easily reach unprivileged and marginalised communities in countries around the world. It can be an empowering tool advocating women’s rights and health issues, building understanding between conflicting groups and focusing on the issues important to the everyday lives of people in their communities. But despite its diverse origin and expanded networks, radio makes very little use of its special opportunities for local communication throughout the world. 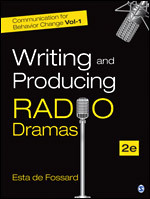 In recently published book by SAGE publications “Communication for Behavior Change: Writing and Producing Radio Dramas Second Edition” author has discussed various challenges that comes with audio communication. Learning through radio presents certain difficulties to both instructor and learners, even in developing countries. Most radio audiences are not “listening literate.” That is, they are not necessarily accustomed to absorbing new knowledge from radio programs. The radio writer faces the many obstacles in delivering new knowledge by radio like the use of radio as “background” listeners do not truly concentrate on what is being broadcast on the radio but they use the radio as a background to daily life. For a successful E-E drama, writers need to motivate the audience to listen with full attention. Radio listeners usually tune out messages and tune in again when music, news, or something of personal interest comes on the air. For this reason, when drama is being used to encourage behavior change, the writer must engage the audience in the story and then introduce social messages subtly and naturally. In this beautifully crafted book author has touched all the aspect of the Writing and Producing Radio Dramas and also how to these can encourage people to make positive behavioral changes to improve their lives. To read more on Writing and Producing Radio Dramas grab your copy now!